Gardening can get expensive when you are growing fruit to feed the birds. Protecting your crop is vital but it has to be in a cost effective way. Allotment owners in Brighton came up with a super idea they used the wood from a tree which needed some heavy maintenance. 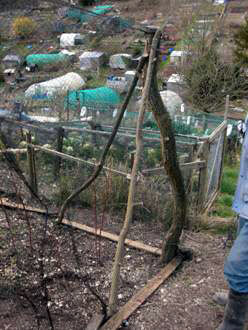 The fruit cage was required to cover an area of approx 4 metres by 4 metres and the height at least 1.8 metres. Four corner posts were felled measuring 2.4m these were sunk into the ground by 600mm. Each of these corner posts were then supported with two struts at about 60 degrees and placed in line with the sides of the fruit cage. The posts were fixed with two 100mm long nails. A larger central supported was cut 2.8m and also sunk to a depth of 600mm giving a finished height of about 2.2m. Wire supports were fitted to the side section and diagonally across the centre support. See the diagram below for more details. Netting was supplied in 4m wide strips and placed over the top of the frame and extended down the side of the cage. At the top, the netting was arranged to overlap and on the side a door access point was formed. The netting was secured to the frame by short pieces of string. At the base of the fruit cage the netting was secured by stapling to pieces of wood which were the remains of an old packing case alternatively the netting can be secured to the ground by pegs. 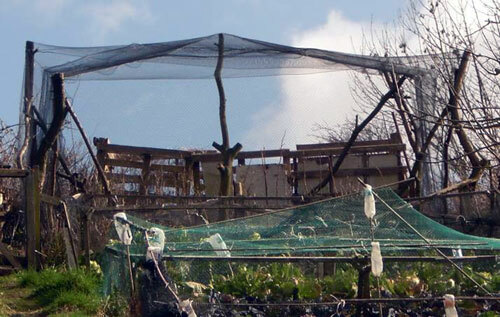 The finished result of the fruit cage blends well with the countryside. This whole project cost a fraction of cost of buying sawn treated timber which would be over £100. Also this type of design lends its self well to installing on slopping ground which is typical of many of the allotments in Brighton.